Nineteen times House Democrats have blocked a vote on a bill that would protect babies who survive an abortion. “It is a shocking reality that the majority party in the people’s House refuses to allow a vote to protect the lives of newborn babies,” Rep. Mike Johnson, R-La., chairman of the Republican Study Committee, said in a statement. This bill simply affords infants born alive during a failed abortion attempt the same care any other newborn would receive. I cannot comprehend how any person could justify standing in the way of these children and the lifesaving care of a physician — but that is the position of today’s Democratic party. On Thursday, House Democrats yet again blocked a vote on the Born-Alive Abortion Survivors Protection Act, which would require medical professionals to give the same medical care to a baby who survives an abortion as they would to any other baby of the same age, and to take the baby to a hospital. Today I asked for unanimous consent for the House to consider the Born Alive Abortion Survivors Protection Act. If an abortionist intentionally kills the child who was born alive, he or she would face fines or up to five years in jail, according to a press release from House Minority Whip Steve Scalise, R-La. Monica Burke, a research assistant in the DeVos Center for Religion and Civil Society at The Heritage Foundation, says the issue shouldn’t be political. 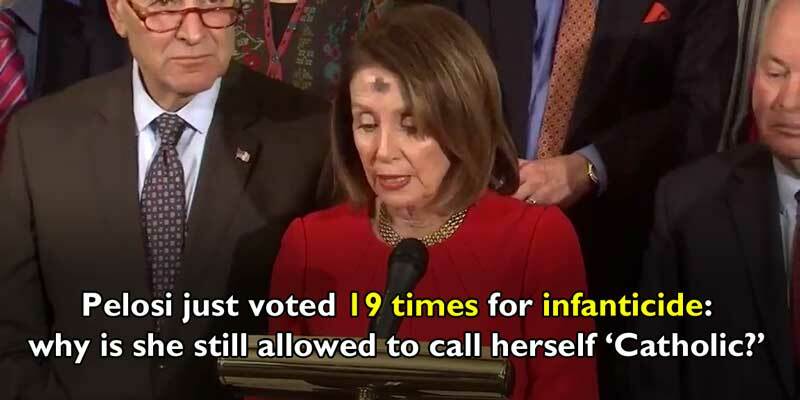 How can Nancy Pelosi be allowed to continue to publicly present herself as a ‘Catholic’ when she supports legislation diametrically opposed to Catholic teaching? While Archbishop Salvatore Cordileone has already instructed Pelosi she should not receive Holy Communion, this is not enough. Pelosi must be excommunicated to stop the scandal of her citing her Catholic faith to advance her political agenda. TAKE ACTION: Contact Archbishop Cordileone at 415.614.5500 and ask him to excommunicate Nancy Pelosi.